Registration fee includes: attendance to all sessions and activities, three breakfasts and two lunch buffets, four refreshment breaks, two evening hospitality functions with hosted bar, and online proceedings of all presentations. Scholarships: A limited number of scholarships are available through Sept. 1. Visit the FAQ for Attendees sheet for details and to download an application. Hotel accommodations at Aspen Meadows Resort adjacent to the meeting space must be reserved separately and are not included in your attendee registration. Book your room early for best rates, and to receive the conference rate of $209 available until August 22 or when sold out. To avoid seeing potential sell out messages when the facility is not sold out, start by choosing only the days of the event, and hitting the "select" button on the room that pops up, then it will take you to a page that will show if rooms are available before or after the days you selected, and you may adjust accordingly. book.passkey.com/go/13thRMUE. If you have any difficulty with your registration call (800) 452-4240 or contact [email protected]. 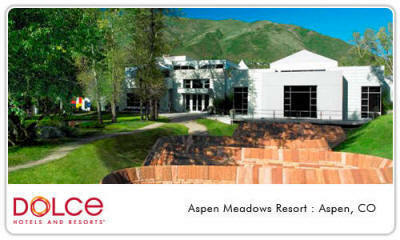 Aspen Meadows Resort in Aspen, Colorado is home to the Aspen Institute. Our meeting will take place in the Doerr-Hosier Conference Center. It is the first building in the Roaring Fork Valley to achieve the Leadership in Energy and Environmental Design (LEED) Green Building Gold Rating. Be aware when planning your route that there is construction on Castle Creek Bridge.